Calendula officinalis, also known as pot marigold (different from the African marigold or Tagetes) is one of those herbs that is constantly surprising. The more you use it, the more you love it. I used to be guilty of that most heinous of crimes, categorising it as a herb for external use only, but now I use it for a wide variety of ailments, and find it to be mostly exceptional at whatever it turns its hand to. Calendula is best known for treating external complaints but it’s a shame to relegate it to such narrow confines when it has a whole host of benefits to offer us. Calendula welcomes visitors along my garden path. I use Calendula in all preparations for sensitive, red and dry skin as its thick resinous consistency not only heals but also protects the skin. It’s often seen in baby care products to gently guard against and heal nappy rash. Its astringency makes it wonderful for wounds and slow healing ailments like ulcers as well as varicose veins for which it is a primary herbal treatment, both internally and externally. It’s often prepared as an oil by infusing the flowers in a base oil like sunflower or sweet almond, preferably twice in the same oil. You can read about how to make an infused oil here which can then be made into a salve or cream such as this one here. 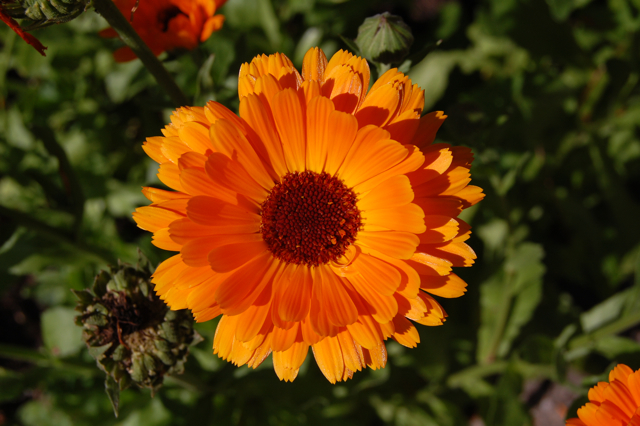 I also like to use calendula flowers in a wash, compress or poultice, especially for weeping sores where using a salve may keep the area too moist and thus encourage infection, even when using anti-microbial herbs. If we think about how Calendula works externally however, we can see that it might well have some powerful actions inside the body too, especially on the mucus membranes which are a bit like the skin inside our bodies’ passageways. Being anti-inflammatory, astringent and demulcent makes it ideal for many gut problems such as ulcers and inflammations where it can help to soothe, heal and protect the stomach and intestines. Add to this the fact that it is anti-fungal and bacteriostatic and you have a great remedy for treating gut dysbiosis and leaky gut type issues where it can simultaneously help balance intestinal flora and heal the gut wall. And it doesn’t stop there. Problems such as these are thought to exacerbate immune function as larger particles of food waste escape into the lymphatics and cause heightened immune response. How incredibly convenient then that Calendula is also a powerful lymphatic and immune supporting herb. Do you ever get the impression nature knows what she’s doing? Calendula is one of my favourite herbs for treating the lymphatic system. If there are swollen glands, a feeling of low grade infection that never really manifests into anything and tiredness and fatigue, it is a great remedy to choose. I use it more as a support for chronic issues, where as I might use echinacea or other herbs for acute issues. Maria Treben used it as both a preventative and healing agent in cancer treatment and it was traditionally considered a gentle but powerful blood cleanser. It also contains some bitter principles which make it useful for gallbladder and liver support and it has been used traditionally for gallbladder inflammations, jaundice and chronic hepatitis. The liver and gallbladder are generally considered to reflect the emotions of anger, irritability and frustration and I always think a herb as cheerful as calendula can’t help but dispel our wrath! Bartram calls it “one of the most versatile and important herbal medicines” and recommends it is taken after all surgical operations. This makes a lot of sense when we consider it is healing, immune supportive and gently cleansing. Though I use Calendula as a tincture, I like it best for internal treatment when taken as a tea. If I feel a bit under the weather I like it with self heal, lime blossom and monarda and if I feel like something cheering to dispel frustrations, it’s lovely with rose and chamomile. Below it’s combined with orange peel and monarda to make a tasty and warming ‘sunshine tea’ that will aid digestion, support the immune system and promote feelings of wellbeing. A Calendula tea or infusion also makes a great treatment for red, tired eyes due to its soothing and astringent properties as well as its anti-inflammatory and antioxidant properties. 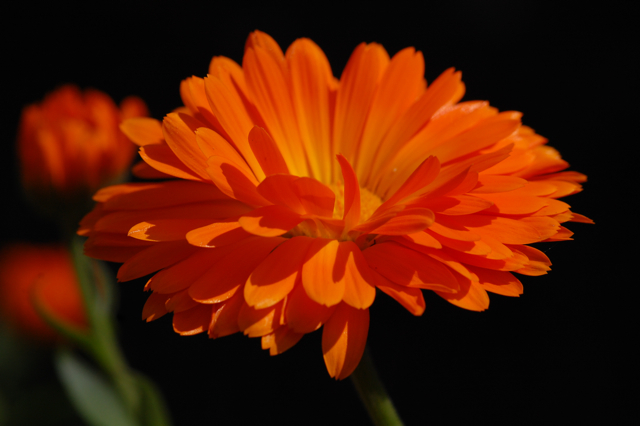 Calendula contains carotenoids like carrots, though I can’t promise it will help you see in the dark! 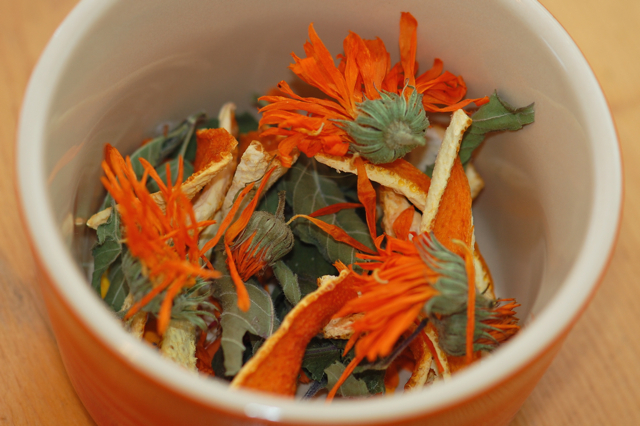 Try Calendula infusions as footbaths for treating athletes foot or in a sitz bath for thrush or cystitis (though of course lifestyle adjustments will also be needed in any condition like this). Calendula sitz baths are also often recommended for women after giving birth to help heal the tissues and prevent infections. Finally, Calendula is gentle and nourishing enough to add to our foods as well as our medicine and the petals look beautiful sprinkled on salads, soups and stews. 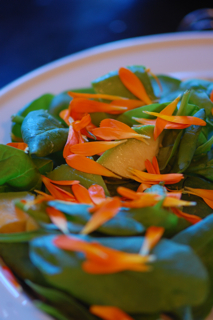 Calendula petals adorn a summer salad. 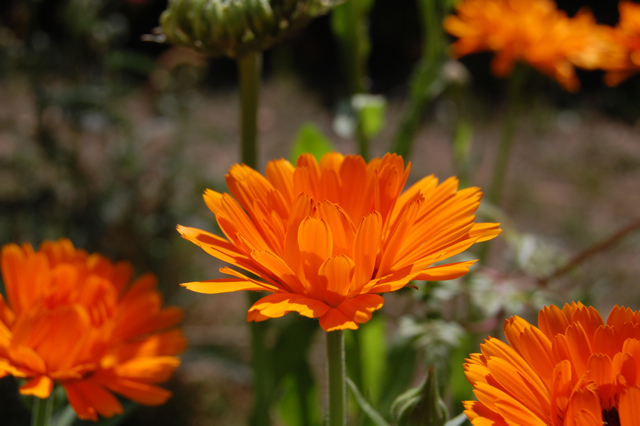 Gather Calendula in the morning sun and dry somewhere warm and airy, away from bright lights. I have always found home dried Calendula to be much more vibrantly orange than anything I have bought, even from well respected suppliers. Tradition says you should gather Calendula when the sun is in Leo or Virgo (August and most of September) but practically it can be collected any time it’s in flower, which luckily for us, is nearly all the summer long. I found out a few days ago how fantastic this flower is. My daughter grazed her cheek after falling from her bike and straight away \I applied the caledula infused oil twice a day. That was one week ago, The scab came off perfectly and it is already healing. I continue to apply it twice a day. Lucinda, for the swollen lymphatic glands, would the infused oil work? I would use the tea for swollen lymphatics, a heaped teaspoon in a mug of hot water, two or three times a day. The oil is better used externally really. I’m glad to hear it helped your daughter’s graze. I’m currently using it on one of my cats who has a cut on her forehead, no doubt from going out brawling at night! I have used them on salads, but that is about it. I shall try a tea at some point and perhaps make a tincture. It is pouring with rain today…….and very very windy. Yes here too, we’ve had gale force winds and relentless rain. The poor chickens were very bedraggled when I got home from work. I hope you enjoy the tea, it’s a great one to drink regularly to get all its great benefits. Once again we see how the best plants for us are the best ones for wildlife too! What a bright and cheery post on such a blustery day for us here in New England! Only a few months ago we moved to this area, so weʻve only begun garden planning for what I would consider a relatively clean slate. Previous owners did virtually nothing to nurture the land around them, so we are devising a master plan for the site. 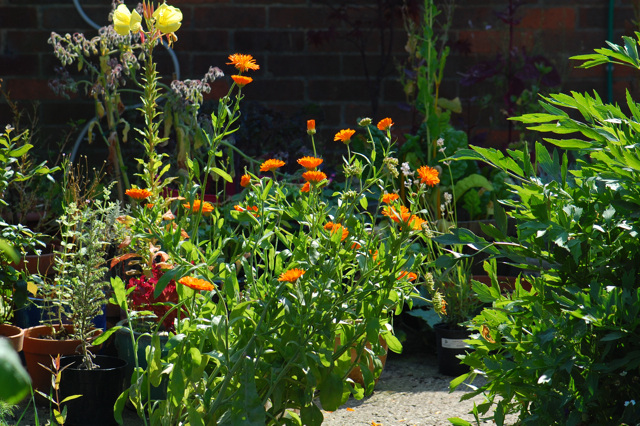 When and where would be appropriate places to plant calendula? It seems very worthwhile to incorporate, either in the garden or a container. Calendula is pretty tolerant really, though it does best in a sunny spot. It’s fine on most soil types, some say it struggles on heavier soils but it’s been beautiful here on our clay soil so you should be fine in any area that doesn’t get too water logged. It self seeds readily too so it can often move into the areas it finds most preferable. A wonderful plant in so many ways it’s definitely worth growing. There are two uses I’ve discovered recently for calendula that I’ve really been loving – one is to pair it with echinacea, elderberry and tulsi in a tincture for taking at the first sign of a cold or flu. Amazing stuff that! The other is that it is SO fabulous for menstrual complaints – especially when sluggish pelvic circulation (of both blood and lymph) leads to painful periods with bloating and cramps. So amazing! I just love your sunshine tea – it looks and sounds delicious and very full of sunshine 🙂 I may have to go make some right now in fact! Also, your dried calendula is just stunning! One can’t help but be cheered simply by seeing your sunny calendula flowers looking so vibrant and happy! Thanks for the reminder about this fantastic “superherb”! That’s interesting to hear, I haven’t really experimented with it for menstrual issues but Messegue really emphasises it as a women’s herb which I found inspiring. It makes a lot of sense with its affinity for mucus membranes and clearing congestion and supporting the lymph. I can think of a couple of people to experiment on so I’ll let you know how it goes! The cold and flu tincture sounds divine too. What a great combination. I’m dreaming of calendula and tulsi tea with elderberry syrup in now as a general fortifying autumn tonic drink. Thanks for the lovely ideas. The Calendula is a wonderful and multifaceted plant,I dried some this year. Your garden path look lovely Lucinda! It’s been years since I had an herb garden, and even then it was a very basic one. One of the reasons I love your blog so much is the inspiration. This sounds like a plant that is essential. I have a very eccentric male friend who gives me pots of plants, and he always ‘tucks things in’ around whatever the main plant is that he’s giving me. This summer he gave me a pot of sage, which was quickly taken over by this lovely plant that looked like chamomile on steroids. When I asked, he told me it was feverfew. I don’t know much about it yet, but I’m thrilled to have a garden beginning. How wonderful, feverfew is a gorgeous plant isn’t it. I have one in the garden that has self seeded in some of the most unlikely places. There is one growing between the paving slabs, so big and lush though it must get very little water! I love the fact that your friend gives you surprise plants, I might have to try that out on some people too. It sounds like a beautiful way to start a garden. Hello – how would I use Calendula for my 5 year old granddaughter who has an infected lymph node for two years as a result of a damaged tooth that had to be extracted. a biopsy has proved clear but the infection lymph stubbornly remains. Could I just dab the cream or tincture on the lymph or does she need to take the tincture internally? Personally I would combine both internal and external treatment. It is always worth going to see a local herbalist to make sure you have the right treatment but Calendula tea or 25% tincture would be good to try dabbed on externally with the tea taken regularly internally with a little honey to sweeten if she prefers. Good luck! Cleavers is excellent when used fresh but it wouldn’t be my first choice to use dried as a tea. 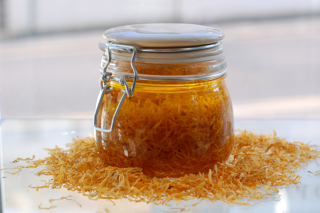 You could combine fresh cleavers and calendula tinctures together to make a nice blend. Exact children’s doses are usually done by weight of the child. There are different systems but this is a general one from one of my tutors. p.s. as a ‘townie’ where do i buy fresh cleavers?! You should be able to buy a tincture that has been made with fresh cleavers rather than dried ones. Sorry if that wasn’t clear.